Case Study Coffee Roasters is the first coffee shop I visited in Portland. Located in the heart of downtown, on the intersection of SW 10th Avenue/Yamhill Street, it is one three branches of this local chain, which roasts all its own coffee in a separate roastery. The downtown branch is glorious. Rectangular in shape, there’s an amazing, copper-topped island counter and floor-to-ceiling windows on both sides, the natural light supplemented by multiple, interesting light-fittings for the odd gloomy day. The seating follows the windows, with the trees lining the streets providing plenty of shade, plus you can sit at the counter, or right at the back whether there are four more tables. The right-hand wall is taken up by a large set of retail shelves. The focus, of course, is firmly on the coffee, all roasted in-house. There is a choice of the house-blend on espresso, joined by a single-origin and decaf. For filter, there’s the obligatory bulk brew, plus a choice of four single-origins through the Kalita Wave filter, which you can watch being made. Finally, Case Study has cold brew, made on the counter using some impressive kit that could have come straight out of a chemistry lab. Case Study, right on the corner of SW 10th Avenue and Yamhill Street, is also at the junction of two of Portland’s major tram/light rail lines, making it very accessible by public transport. Rectangular, the short side runs along 10th Avenue, the door on the right. As you enter, the centrepiece of the whole store, the magnificent island counter, stands directly in front of you, occupying the middle of the room. A perfect example of its kind, it dominates and defines the space. It’s also a work of art, wooden-fronted and topped with a projecting, polished copper top, which means you can actually have somewhere to put your legs when you sit at the counter! If you walk straight ahead, down the counter’s right-hand side, you’ll find the till, next to the cakes, with the retail section handily-placed behind you on the right-hand wall. Going the other way, the 3-group La Marzocco Strada and its three grinders (house-blend, single-origin and decaf) occupy the counter’s front. Next comes the brew-bar, with kettles, Kalita-wave filters and jars of beans (four in all). You can sit here, where the counter is low, or further along, just past the cold-brew apparatus, where you’ll also find an EK-43 and bulk-brewer. The seating starts to the door’s left, running around 10th Avenue, down Yamhill Street and along the back wall. Mostly it’s two-person round tables, but in the corner opposite the door there’s a small, raised area with a window-bar on the left and a low bar on the right. This is double-sided, with stools on both sides, but to the right, the floor’s no longer raised, so the low bar becomes a high one! A pair of two-person, square tables occupy the back wall, with another two between them and the counter, one either side of a wooden pillar supporting the ceiling. Finally, you can sit at the counter itself, either on the left, or right at the back, where there are plenty of high-backed swivel chairs. Other than copper-topped counter, everything is wood, with white-painted walls and ceiling. There’s music, which isn’t that loud and, while it blends in well with the hum of conversation, Case Study’s not a quiet spot. I had a very geeky coffee-conversation with the staff. The consensus was that the house-blend went best with milk, but the barista’s recommend was to try the single-origin, a washed Ethiopian Sidamo, both as an espresso and with milk. Well, I was never going to turn that recommendation down. As an espresso, it wasn’t what I was expecting. Smooth, complex and well-balanced, there was no sharpness to it, nor was it too sweet. It felt very rounded in the mouth, and, while not something I would drink every day, it challenged my preconceptions of what espresso can be. Served with a small, tall glass of sparkling water, I’d venture to say it was ever better than the Ethiopian single-origin I had at Heart Coffee Roasters. In milk, we agreed on a cortado. It was clearly the same coffee, but the milk fills it out. I find these sorts of espresso often produce discordant notes, the coffee’s punch at odds with the milk’s sweetness. Case Study’s single-origin went superbly with milk, the two complimenting each other, neither dominating. I could definitely drink this every day! The milk also held its pattern to the bottom of the glass, but I was enjoying drinking it so much that I forgot to photograph it! I paired my coffee with an Almond Joy Morning Bun. Swirled pastry, with an almond topping and sticky honey glaze, it was perfect! 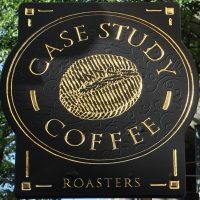 This entry was posted in Cafe/Roaster, Cake, Coffee Shops, Island Counters, Laptop Friendly, Portland (Oregon) and tagged Case Study, include, PortlandPortland2015 by Brian Williams. Bookmark the permalink. Nice review, Brian. Case Study is lovely, isn’t it? I had one coffee brewed through three different filter methods as part of the Third Wave coffee tour I was doing, but it sounds as though I missed a trick by not trying the espresso too. Totally agree on the pastries front, though; divine!